It’s great to see Mark Goodacre is back up to full speed with his blog at New Testament Gateway. Mark’s currently exploring the relationship between the contrasting accounts of Paul’s visits to Jerusalem in Acts and Galatians. It’s a subject I’ve looked at in some length before and it’s one of those subjects I find fascinating. Mark’s posts are making me re-consider my position, which is always good, and I’d suggest taking a peak yourself. So I thought it would be good to look at the various ways these incidents have been portrayed on film, and see how they try and combine the source material into a coherent account. The Living Bible series takes a fairly literal approach to the bible and Acts is no exception. 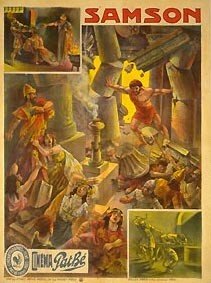 The story is largely narrated, intentionally based on Acts and rarely adds extra-biblical material. 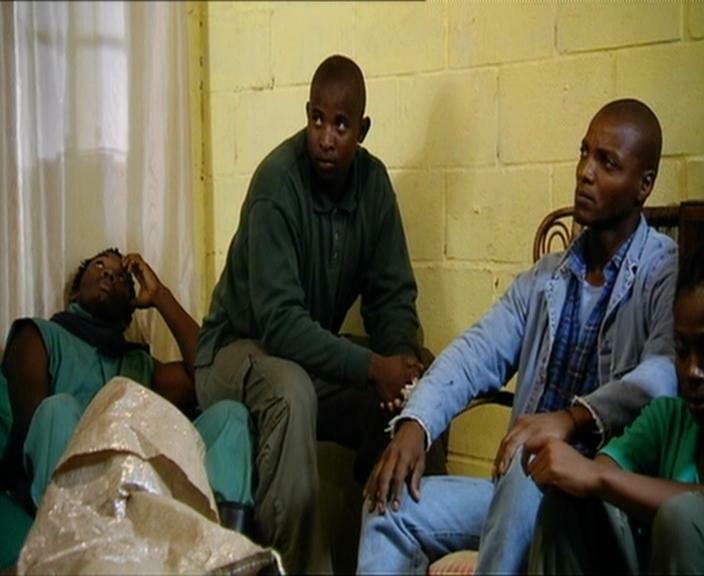 However, the 160 or so minutes run time is divided into 10 self contained episodes, and as a result there are incidents present in Acts but which falls between episodes. Episode 3 Light From Heaven deals with the conversion of Saul, but leaves him in Damascus, before flashing forward to a far older Paul reciting 1 Tim 1:15-17. The next episode is No Respecter of Persons which deals with Peter and Cornelius and so Paul’s possible visit to Jerusalem at this point is omitted. The fifth episode is God’s Care of his Own which deals with the church’s collection for those in Jerusalem, and Peter’s escape from prison. Whilst we see Paul and Barnabas making the collection, and setting off to take it to Jerusalem, we never actually see them arrive. Hence, the point at which the two of them arrive is left open to interpretation, and could be read as suggesting that they arrived much later and that there are parallel chronologies here. Episode 6 is simply a conglomerate of mission related clips from the first 13 chapters of Acts, but in episode 7, Salvation and Christian Fellowship we arrive at the council at Jerusalem. The council is initially a very public affair, but cleverly incorporates the word “privately” in Gal 2:2 by having a smaller group go to a different room to make their decision which reflects Acts rather than Galatians. Unusually here there is heavy interpretation applied. The film’s narrator describes the decision as reflecting the majority, and calls council’s letter a “happy solution”, and “wonderfully friendly and frank”. 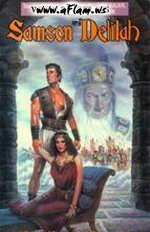 So the film appears to support aligning Gal 2:11-16 with events leading up to the council (Acst 15:1-2) rather than following it as the Galatian letter suggests, although it has such a high view of Peter that his involvement is absent here. Here only two people lower Saul from the walls of Damascus, and the implication is that these are not his disciples. Paul is also beaten in Damascus (no reference in the text) We are then told it is 38AD and Paul is in Jerusalem to see Peter. 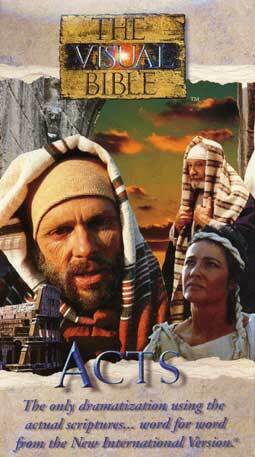 The film here deftly combines the accounts from Acts 9:26-31 and Galatians 1:18-24. Paul comes to Jerusalem to talk to Peter, but the apostles are afraid of him. Barnabas arranges a meeting between the two and Peter and Paul spend a lot of time together, which it is easy to conceive is the 15 days of Gal. 1:18 (Peter even takes Paul to Galilee). Finally Paul meets James, and leaves for Tarsus (Acts 9:30). It is then 8 years before we meet Saul again (46 AD). Barnbas mentions that Jerusalem is starving (rather than Agabus prophesying it) and tells Paul about the forthcoming meeting in Antioch. We never see this meeting instead the action moved onto Peter’s escape from Prison in Acts 12. 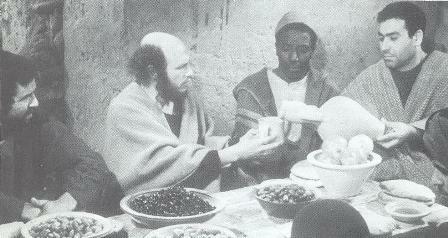 When he arrives at the house of Mary and John Mark, Barnabas has just also arrived without Paul, but with a supply of food. Clearly this is a slight, but significant alteration. The film moves fairly meticulously through the available material at this point, eventually ending up with the council in Jerusalem (precipitated by Barnabas being told on his trip to Jerusalem that Greeks have to conform to Jewish law). The Jerusalem Council starts as a large and angry affair, but manoeuvres skilfully around the word “privately” in Gal 2:2 by having the major players go off into a side room to decide what to do. James’s decision, though, is to place “no restrictions” on the Gentile believers appearing to prefer Galatians to Acts. Peter then accompanies Paul to Antioch, and it is then that the events of Gal 2:11-14 occur. It is here that we see this film’s cleverest pieces of writing. The men that arrive from James bring the letter of Acts 15:23-30. The split from Barnabas is both due to his seeing Peter’s point of view and his support for John Mark (the reason given in Acts and in Galatians). Thus Paul continues his misson without ever having been party to the restrictions on the Gentiles. This is a 3 hour word for word visualisation of Acts and so it has to present all of the Acts material and obviously largely ignores Galatians. Because it uses the NIV Paul’s escape from Damascus is assisted by his “followers” rather than the more committed-sounding “disciples” in some translations. 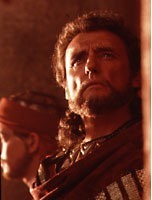 Interestingly once this action has been shown we cut to a boat where an older Luke narrates the events of Acts 9:27-31. The text then continues with stories about Peter, and some of these are shown whilst others are again narrated from the boat. Significantly Acts 11:25-30 is again just narrated. The action returns for the story about Peter’s imprisonment, and Herod’s death. We do see Paul in relation to Act 12:24, but he is not in Jerusalem, but walking in the countryside. When it comes to the Jerusalem council, we are shown the action, although again the dispute in Antioch is not depicted (Luke simply smiles as he narrates this argument – hardly the way Paul feels about this dispute). The council of Jerusalem seems like a very well mannered affair. We also do not see the letter of Acts 15:23-29. So whilst the nature of this project means that the film has to narrate these passages, the visuals do all they can to downplay the early appearance(s) in Jerusalem, and the controversy that led to the events of Acts 1. Whether this is just to avoid alienating some of their potential audience, or just to avoid commenting on such issues is hard to discern. This is a very short film about Paul, and actually focuses a high proportion of its run time on the later part of Acts. Strangely it leaves out any trips by Paul to Jerusalem prior to the events of Acts 21. It’s main focus is on Paul’s preaching and so it ignores the theological issues that Council of Jerusalem throws up, in order to spend more time listening to Paul’s speeches such as that at Athens. Paul goes from Damascus to Jerusalem and meets Peter (and James) in a private meeting. He stays around Jerusalem and has another private meeting with Peter and James later on. They agree that Peter should go to Lydda, Barnabas to Antioch, Paul to Tarsus (9:30) whilst James stays in Jerusalem. So this is clearly Acts 9 territory. Initially Peter wants to delay message to Gentiles, and both he and James see it as meaning new rules for any potential gentile converts. Next time we see Peter he recounts his vision, but submits to James over Jewish/Gentile practice. Later Barnabas collect Paul from Tarsus (Acts 11:25-26) and they head to Cyprus (Acts 13:2-4), Herod dies (Acts 12:20-25), Paul and Barnabas go to Lystra, before arriving in Antioch. Once in Antioch, Peter, and some people from James are there, and Paul accuses him and Barnabas of hypocrisy. 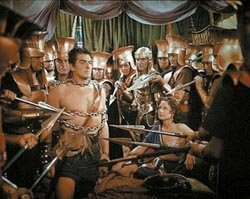 So the film ties together the Acts 15 and Gal 2 accounts. The chronology fits with Acts (and goes against the order in Galatians 2), but Barnabas’s hypocrisy is in line with Galatians 2. This is followed by the Jerusalem council which is of such a size so it can be interpreted as either private or public. Peter is persuaded by Paul’s arguments, and so James decides that there is no burden except to keep the (ten) commandments, and there is no mention of the collection or of the letter. 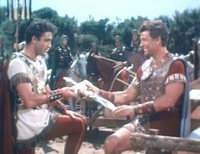 Paul and Barnabas then split over whether to go to Rome or not, ignoring both the excuse about Mark from Acts and the explanation in Galatians regarding Barnabas. Next thing, Paul is in Athens (Acts 17) and the film moves on. One final observation, it is interesting to see how the film’s early baptisms are sprinklings whereas a later baptism is carried out by full immersion. There are two other relevant films that I’ve been unable to cover. 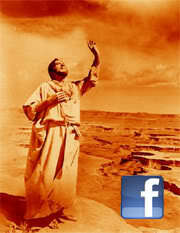 The most well known is AD / Anno Domini the TV series from 1985, which I saw when I was a boy, but have not seen since. If any of you who have seen it more recently (or even own it) want to contribute how this films deals with these issues, please do so via the comments. The other is Roberto Rosellini’s Atti Degli Apostoli which at 5 hours and 42 minutes is almost twice as long as any of the other films. Given that runtime, and since it also downplays the supernatural events recorded in Acts one would expect it to give a good amount of time to these events, and indeed it does. Almost all of the "fourth chapter" is given over to the Council of Jerusalem. It is interesting that none of these films support the minority conservative chronology (that equates Gal. 1 with Acts 9, and Gal 2 with Acts 11), and that they tend to equate the first visit with Acts 9 and the second with Acts 15, generally downplaying Acts 11 and 12. However, the dispute with Peter (Gal 2:11-14) occurs in various places, both before and after the Council of Jerusalem, in watered down form, or not at all. Speaking of Film Chat, Peter has also done an in depth analysis of the depictions of Mary in the Ben-Hur movies. There are screen grabs a plenty, and a couple of very interesting points about how Mary, like Jesus is almost absent in the second film. I have a hunch that Peter will be posting a number of similar articles to this one over the next few months. Nativity Story Queen Spoo seems to be doing a brilliant job of hunting down various members of the cast and crew for exclusive interviews. A couple of weeks ago she interviewed composer Mychael Danna. Her latest is an interview with Alexander Siddig who plays the Angel Gabriel. From the promo shot (right), it looks like Gabriel's costume will be very traditional (in contrast to say the highly creative angel costumes of Son of Man), and Siddig's answers suggest this too. Peter Chattaway has already done a fairly thorough analysis of the interview so I've not got anything to add. 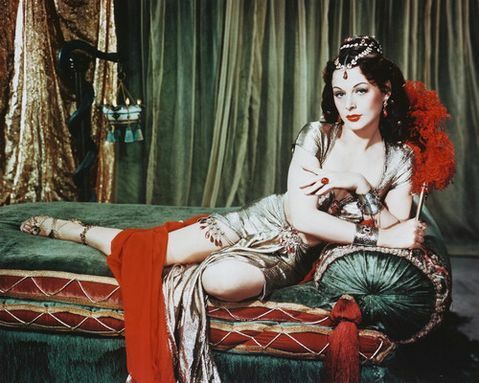 Secondly, I have discovered another blog devoted to this film. News of the Nativity Story is run by Thur Broeders, who has been runnign it since May. There are a few extra features I've missed there including a recent piece on Ciarin Hinds from the Daily Telegraph, and a fairly interesting piece from The Oregonian. 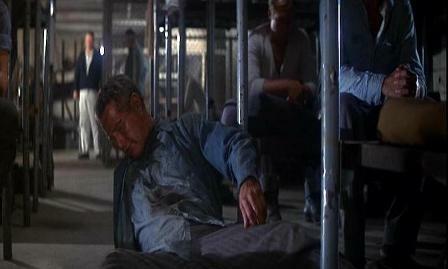 Cool Hand Luke has been one of my very favourite films for a long time now. Whilst I appreciate that it isn't the most technically or artistically excellent film in the history of cinema, there's plenty of those things to admire and so somehow it's just found a special place in my heart. However, until last night, I'd never actually seen it in widescreen, or on DVD. I have to say it was an incredible experience - almost like watching it again for the first time. For a long time I was cynical of both the widescreen TV, and the DVD agenda and saw them as unnecessary ideas to milk money from a gullible public. Whilst I don't doubt that such reasons have accelerated the revolution (compare the time DVDs took to gain market dominance over VHS compared to the replacement of audio tapes with CDs), I have to say I have changed my mind. Watching Cool Hand Luke in widescreen converted what had been fairly unspectacular compositions into memorable ones, and the extra clarity of the DVD image gave fairly uninspiring images into objects of beauty. All of a sudden there was scene after scene of parallel lines tracking t-heir way to their vanishing point on the horizon, and arrays of single light bulbs contrasted against deeper, darker backgrounds. 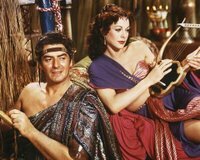 The film is particularly relevant to this blog inasmuch as it is the classic example of a "Christ-figure film". Messianic imagery is fairly common these days, whether it's in ET, Braveheart, The Matrix or Gladiator, but it was considerably rarer back in 1967, and this film has far more Christological richness than any of those modern films. Furthermore the film invites us to examine the parallels with two very specific shots which can only have been designed to draw comnparison. The first (shown above) is perhaps the most obvious, but the final shot also lays over the shot of the road where the chain gang continue with the torn, and now repaired, photo of Luke heralded by two "angels" (Dragline's words not mine) seemingly floating in the skies. Significantly, whilst we saw the photo being torn in unevenly several times, the tears on the final photo form a cross (i.e. a maximum of three tears in half). Most discussions of this film, however, read it a little simplistically. Rather than the film being a simple form of semi-allegory, it creates images and a story line which draw comparisons to the life of Jesus, but these comparisons fall in a non-linear, and sometimes multiple way. Consider for example the end of the lives of Jesus and Luke. In the gospels, Jesus is i- betrayed, ii- arrested, iii-tried, iv-beaten, v-walked to the point of execution, vi-killed, vii-buried, viii-resurrected, and finally ix-ascends whilst x-the church is born. Luke however is betrayed at least twice. Once during his first escape by a fellow inmate who decides at the last minute to try to escape, but does so in such a noisy fashion that he draws attention to Luke's escape. 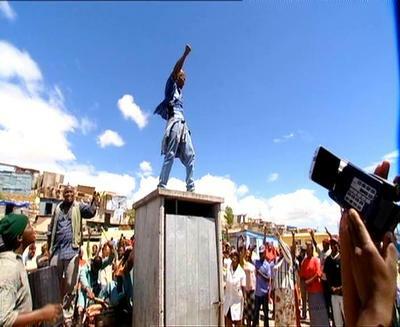 We see an overhead shot of this prisoner hanging onto a tall wooden fence post which evokes a comparison with Judas. However, this shot is often overlooked in favour of a comparison with Dragline who brings the authorities to Luke at the end of the film. The film invites that latter comparison as well, but it is too simplistic to say that Dragline=Judas. In most other places in the film, both before and after this betrayal, Dragline functions as Peter. Dragline's burly figure fits with the stereotypical (though extra-biblical) image of the big fisherman, he is the leader amongst the apostles both before his betrayal, and, significantly, after it, when he is shown testifying to the others what occurred that night (shown right). 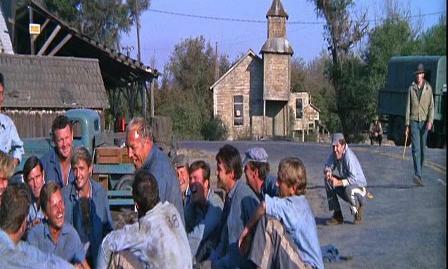 The film breaks with the logic of the film to show this moment - this location is over an hour's drive from the prison, and the chain-gang are neither working or eating when Dragline tells his story. In a similar way Luke's death is depicted twice. Obviously Luke's actual death occurs at the climax of the film. But the image of Luke lying flat on his back in grave-like hole is too obvious to ignore (see right). 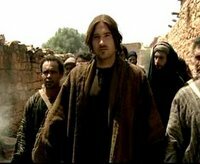 There are also several long via-dolosa style walks, Gethsemane-like questioning moments, and beatings - in retrospect, the early boxing match is very reminiscent of Gibson's later Passion of the Christ . We also see Luke give his great commission to Dragline (who is on his knees) before Dragline's betrayal: "I done enough world shaking for a while, you do the rest of it for me." 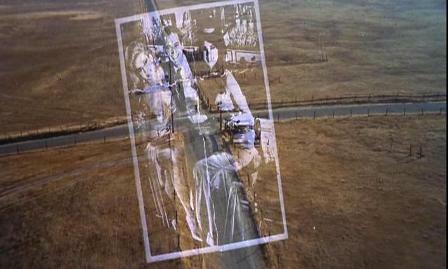 This scene in itself functions as an ascension scene, Luke moves away from Dragline towards the sanctity of a church where he converses with his father. So too then, there are two ascensions. Hence the comparisons with the story of Jesus do not directly correspond, but criss-cross in numerous places. There are multiple depictions of certain scenes, whilst certain scenes in Luke's story have no points of comparison. 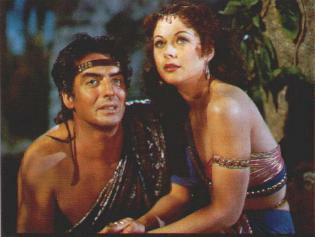 Additionally, the characters in the film may map to a number of biblical characters or none. One other aspect that is hardly ever commented on is the music. The film's music is both diegetic (i.e. generated by action such as Luke playing his banjo) and Non-diegetic (i.e. laid on top of the film afterwards). 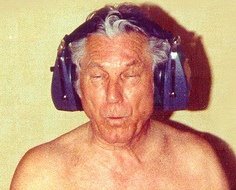 The digetic music is particularly significant, and nearly all the songs played have a religious significance. When Luke's mother pays him a farewell visit him (before her illness finally kills her), Luke's return to the compound is accompanied by the Harry Dean Stanton character singing" Through the days of toil that's near, if I fall dear Lord who cares? Who but thee my burden shares? None but thee dear Lord, none but Thee". Later on, Luke vents his grief and anger by singing "Plastic Jesus". 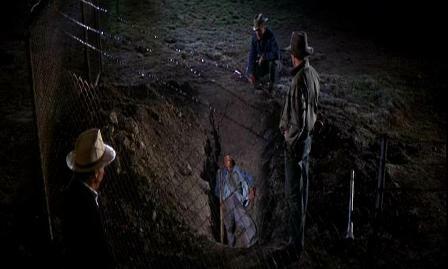 Even later Stanton's character's sings "Ain't no Grave gonna keep my body down...keep your mind on the above". All these add to the religious texture of the film. The best Christ figure films function in at least two ways. Firstly they act as a form of incarnation - bringing Jesus to the people in an everyday way that is far easier to relate to than the first century Jewish context he actually came in. Secondly they should also shed further light on the Jesus story, by inviting the viewer to look at it from a new angle. 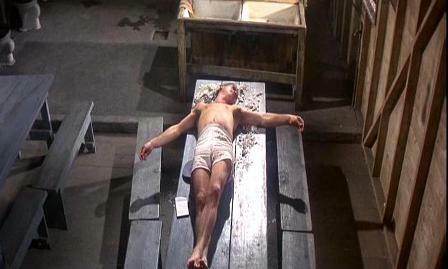 Cool Hand Luke is particularly successful in this regard. Partly because it throws out linear parallelism in favour of a much richer, multi-faceted approach, partly because the film's music underlines some of these comparisons, and also shines light on the story, and partly because it's central character is able to interact with God. Luke's conversational prayers have two layers of meaning both taken with the obvious and intended sarcasm, but also when taken at face value they enhance the spiritual resonances within the film. Ever since my review and scene guide for Jezile (Son of Man) I’ve been meaning to post something specifically about the various speeches Jesus gives in the film. 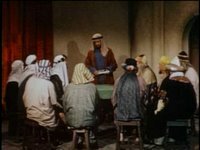 Jesus’s speeches in this film are more political than any other Jesus film I can think of, and this has been considered one of the reasons why the film has yet to have a wide release in the US. Claiming a political stance for Jesus is a risky business (although that doesn’t seem to stop many people), but I think this film does it reasonably well. Whilst it may look on the surface like this film’s Jesus makes ‘political’ speeches as opposed to the ‘spiritual’ ones of the gospels, I want to examine the two key speeches in the film to see exactly what they do say and how much of it has a basis in the source texts. (Inevitably this list will not be exhaustive). But this never becomes the right to kill. We are too busy with modern trivialities as if they are the most important things. If you constantly find fault with yourself, you will lose the struggle with real sin. All authority is not divinely instituted. If you follow me we will have peace. I’m not here to destroy beliefs and traditions but to create them anew. We must forgive those who offend us and those who trample on our comrades, otherwise our hatred will destroy our future. When those with imperial histories pretend to forget them, and blame Africa’s problems on tribalism and corruption, while building themselves new economic empires, I say we have been lied to. Evil did not fall. When I hear someone was beaten and tortured in the Middle East I say we have been lied to. Evil did not fall. When I hear that in Asia child labour has been legislated for I say we have been lied to. Evil did not fall. When you are told, and you will be, that people just “disappear” you must say we have been lied to. And evil will fall. This is perhaps the Key speech that the film presents. The opening sentence seems to summarise Matt 6:25-34 nicely, but the rest of that paragraph sounds more like the kind of things we think Jesus would say, rather than being things he actually did say. In fact, it could be argued that these sentences go against certain things Jesus said. For example, Jesus considered that each person needs to eradicate the personal sin in their lives (based on say Mark 9:43-48 and parallels). Alternatively, John 19:11 records Jesus telling Pilate that his (corrupt) power was divinely instituted. That said it’s also worth noting that Jesus says “All Authority on Heaven and earth has been given to me”. But this paragraph is just the opening to the speech, when it gets going it is clearly expounding the teaching of Jesus evoking Matt 5:17 (“I am not come to destroy the law, but to fulfil”), Matt 5:38-48 (Love your enemies), Matt 6:14-15 (Forgive men their sins). The final part of this speech is reminiscent of the sending of the seventy two in Luke 10, particularly the line about seeing “Satan fall” (v.18). From the film’s point of view, however, this final line is also significant because it explains the significance of the film’s later variation of Jesus’s “crucifixion”. In some ways, however, picking through these two speeches to find echoes of verses from the gospels is only one way to approach this, and it is perhaps more reasonable to examine the speeches as a whole and ask whether they fit a biblical perspective or not. There is a huge swathe of individual verses which are used to justify non-violence as something Jesus both taught and practised, but no single speech that neatly sums up that philosophy. Clearly the filmmakers have taken the stance that it is appropriate to lump these disparate quotes together in order to forge two such speeches, and I’m certainly sympathetic to that approach. The problem with this methodology is that things are not always that simple. Jesus may have said "those who live by the sword, will die by the sword" (Matt 26:52) after Peter had cut of Malchus’s ear, but the reason he had the sword in the first place is because it seems that Jesus told him to bring it (Luke 22:36, 38). On balance, I personally see the various words from the Sermon on the Mount, and Jesus’s example as he is arrested, tortured and killed, as outweighing the verses that are routinely used to argue for violent / military methods on occasion. I have to admit, however, that the Luke 22 verses trouble me. But then it’s easy to sit in my ivory tower and pontificate about such things. What Dornford-May and co. have done is take a radical message about non-violence to a context where the words of Jesus still need to be heard. Somehow I (and the places I get my info from) missed this, but Nativity Story director Catherine Hardwicke was interviewed in Entertainment Weekly last month. It's a disappointingly banal piece, apparently taking a single (though lengthy) anecdote and making it into the whole "interview". Did the interviewer ask any other questions, or did they just think, "Ah, I have a whimsical story about misbehaving cows, what else do I need". I could just be being overly harsh towards the journalist involved, but in the little snippets I've seen of Hardwicke, such as the featurettes on the official website. Anyone interested in more substantial answers may want to consider popping down to the 2006 Heartland Film Festival, where the film will also be showing on the 22nd October and will be followed up with a Q&A with Hardwicke (hat tip to FilmChat). The other major piece of news is that an album called "The Nativity Story: Sacred Songs" will be released on the 31st October. Amazon are calling it a soundtrack, but with that name I wonder if it is "songs that inspired the film" type affair. Certainly this film has borrowed their photo-book idea from The Passion, so it wouldn't surprise me if they used this idea as well. Thanks to Queen Spoo for that one. Anyone interested in the soundtrack might be interested in reading Spoo's interview with the composer. 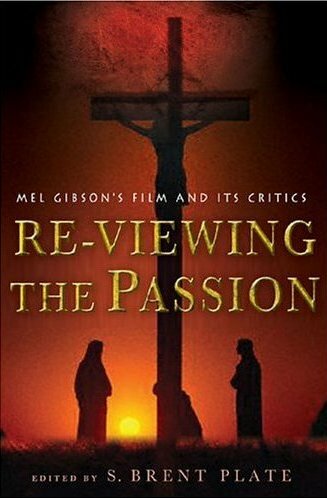 I just came across an article on Jesus films by S. Brent Plate, editor of the book "Re-Viewing the Passion: Mel Gibson's Film and Its Critics", which featured a chapter by Peter Chattaway. I think it’s time to stop having biblical critics tell us about the real Jesus. Don't get me wrong, some of my best friends are biblical critics, but I'm quite sure they would agree that a historically accurate Jesus only gets us so far. There is never only one. The problem with this historical rubric, as with so much of current U.S. political conversation, is that it all boils down to one singular correct view, and we are each either a winner or loser...Such either/or theological and political discussion reduces the great complexity of these issues, and few seem willing to stop and wait and talk it through and realize that truth may be richer, more multifaceted, more messy. In other words, the reason we keep getting more and more Jesus films (the varieties are now as old as cinema itself) is that Jesus is never just one thing. The fundamental paradox is that Jesus becomes historical only and when people from various times and places can find a particular and personal relation to this figure in their here and now. For Christians, historically in the past and in the present, Jesus is not reducible to a one-dimensional object situated in the past, and the variety of Jesus films in the past 100 years shows how this might be true. How people saw Jesus in his day was quite varied, which is why early Christians retained the radical idea of authorizing four different versions of the life of Jesus: the gospels of the New Testament. 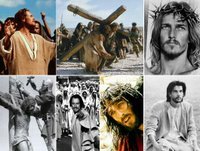 The plurality at the heart of the Christian story is best understood in contemporary times through the plethora of Jesus films. But what is needed to make sense of this Jesus, these Jesuses, on Holy Week re-screenings, are a panel of experts who range from art history to film studies to Christian theology to religious studies to biblical criticism. Such a range would get us to realize the multifaceted dimensions of the mythologizing process. I'm not sure I quite agree with all of this, but certainly Jesus films viewed hand in hand with the biblical texts and a growing knowledge of the historical context in which they were written is a more powerful combination that with just the texts and history alone. Films about the Bible in general, and Jesus in particular force us out of our own perspectives, and make us see the events through someone else's eyes. This is crucial for eliminating our own historical / spiritual / academic / denominational / religious blindspots. We may of course reject the perspectives of those films, particularly in the light of our knowledge of the gospels and history, but from time to time they will also give us a sufficiently new perspective to enable us to see something for the first time. But like the plurality of the four gospels we need to guard against one or two films dominating our perspectives, particularly given the power of the medium of film. I've been doing a bit of hunting on the internet and turned up a stack of Jesus films I wasn't really conscious of, all of which are from Mexico. Firstly there is Jesús, Nuestro Señor (Our Mr Jesus?) which Amazon lists as 1969, but the IMDB dates as 1971. 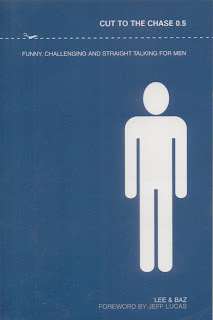 It's available at Amazon. A number of these films are only concerned with Jesus's childhood [Jesus, Maria y Jose (1972), or Jesus el Niño Dios (Jesus, the God Boy? 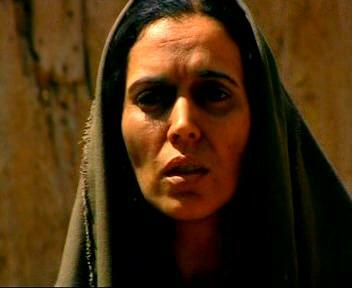 - 1971), Un Nino Llamado Jesus (A Boy Named Jesus - 1987) or with Jesus and Mary Magdalene (María Magdalena (1946)). 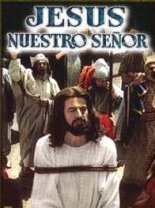 Jesus,El Nino De Dios, Jesus,Maria Y Jose and Jesus,Nuestro Senor, are actually a trilogy of films by Miguel Zacarias. 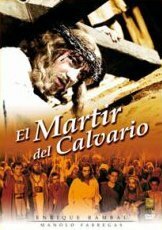 Finally there is El Mártir del Calvario (The Martyr of Calvary - 1952), which is currently described on the IMDB as the "The most arrogant Jesus ever!". Being from Mexico I imagine most of these films are from a Catholic persuasion. Has anyone seen any of them? Most of what I know of them comes from an Amazon user known there by the name All Sufficiency. Thanks for your work AS! Peter Chattaway has asked himself the question Who is the youngest Mary of them all? He goes on to list all the major Jesus films that portray Mary and (where available) the ages of each actress. Peter is brilliant at this kind of stuff, due to his attention to detail, his vast knowledge, and his throughness. By the way, the picture is not actually from a Jesus film but the BBC's 2002 doucmentary on Mary by David McNab, and the team who put together the recent Miracles of Jesus series. Mary was played by Ghislan Roujna, one of three different Marys in the programme, and for someone of her age her acting was amazing, and very powerful. 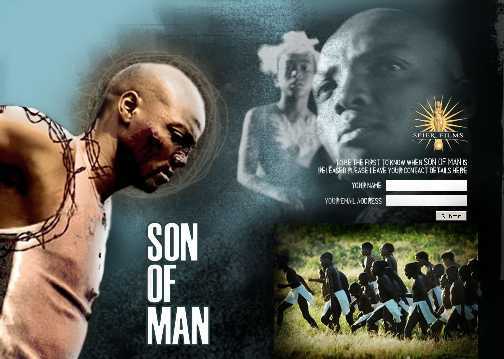 Last month, I reviewed Mark Dornford-May's Son of Man (see also my scene guide) which, after rave reviews after Sundance, is now starting to get some wider distribution. The main news is that there is now an official website at Spier Films. There's not much on it just yet, but you can sign up for details of its release. I've updated the side-bar list of forthcoming films accordingly, and also put it in a slightly more sensible order of release date (rather than the bizarre order it was in before). Whilst I'm at it, I've added a couple of extra items to my blogroll. 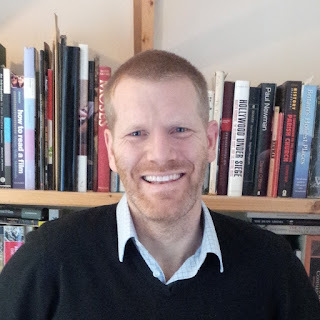 Gareth Higgins is author of one of my favourite Faith and Film books - "How Movies Helped Save My Soul" and does the annual Film review of the year at the Greenbelt Festival (and is far too humble to mention either). Definitely one to keep an eye on if you're a film lover. Matt Rees, and I did a year out together, which, amazingly, was ten years ago now. It's good to bump into him again in cyberspace. Finally Robert Torry and Paul Flesher have a blog called Film and Religion which will tie in with their forthcoming book of the same title. For some time I've been toying with the idea of supplementing written commentary on bible films with some audio files, as much as anything I guess because podcasting is becoming more and more popular, and because some people just don't read. An extra incentive is that as far as I'm aware, no-one else is doing this right now. 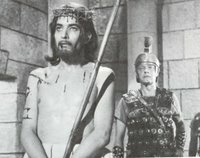 So I've set up a new website Jesus Films Podcast, where I'll be tackling one Jesus film per month. The aim is to make them about ten minutes long, and perhaps include the odd soundbite and so on. And of course they'll be free. For anyone interested in "subscribing" there is an RSS Feed. I plan to start in October, with Jesus of Nazareth (1977), but for now I've put up an introductory mp3, which was really just to give me a chance to practice with the technology. I'm surprised, though, to find that it's already been downloaded 40 times since I posted it on Friday. If anyone has any useful ideas, then please let me know. I discussed D.W. Griffiths' 1916 epic Intolerance last week. Since then I've discovered a 16mm version of it has gone for sale at eBay . Thought some who frequents the site might be interested. I've known Jeffrey Overstreet for a number of years now, and he has taught me as much about film appreciation as anyone I can think of. So I was really pleased to hear that he's getting a book published this autumn. 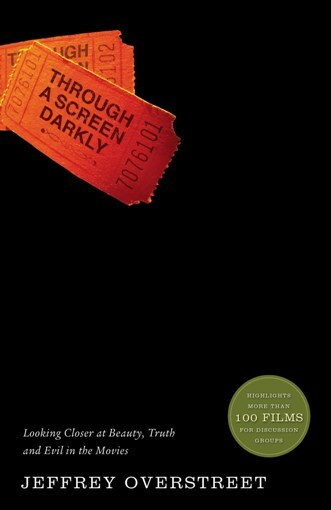 "Through a Screen Darkly" will be available on the 5th February next year, and Amazon have finally added a picture of the cool front cover to their pre-order page. And it looks like it will be available in the UK too! Jeffrey has also started a blog for the book - Through a Screen Darkly - The Blog. 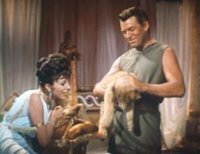 Over at Queen Spoo's blog for The Nativity Story, she has conducted an interview with Mychael Danna, the composer for the film. He has an impressive CV including Capote, Vanity Fair, Girl Interrupted, and a couple of Ang Lee films Ride With the Devil and Hulk - the soundtrack of which I loved. I did a lot of research on music of Judea and Palestine at the time. I learned a lot and then decided not to use any of it. The reason for that is I find that ever since Peter Gabriel’s work for “The Last Temptation of Christ” composers have all approached the same era and subject matter with the exact same things. We hear all the same instruments and the same vaguely Middle Eastern sound. The fact is, nobody really knows what the music of that time was...I’m kind of tired of that approach. I think it’s time for something fresh. The other thing is that I think this story has its big resonance not in the Middle East. It’s not really a story about the Jews. It’s really a story about Christians and about Europe and about the incredibly profound event. The meaning of this event really resonated through the entire civilization of the West. This event this meant so much and affected every moment in life in a civilization was in Medieval Europe, the Middle Ages and Renaissance Europe. So that’s where I’ve gone to for the inspiration for the music. I’m using early European instruments from the 12th-14th centuries. I’m using a lot of melodies from the early Christian church: plain chant, Gregorian chant. I’m also using some very early Christmas melodies, for instance “O Come, O Come, Emmanuel,” which is a very ancient melody. I’m using other tunes like “Of the Father’s Love Begotten,” which goes back to the late Roman Empire when the empire became Christian from about the year 400. I’ve been using melodies from before 1600, or something like that. It’s a story of Europe and a story about the west and Western Civilization. That’s really been the inspiration. 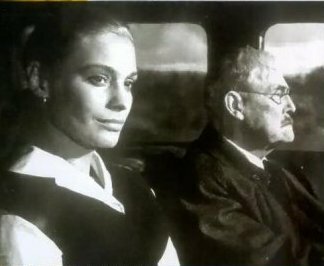 Over at FilmChat, Peter compares Danna's approach with that of Il Vangelo Secondo Matteo (1964), (and I can see his point). That is my favourite soundtrack for any Jesus film thus far. What I find interesting is that this is further confirmation that this film is focussing on the meaning of the story, rather than its history, and recreating things exactly as they happened. 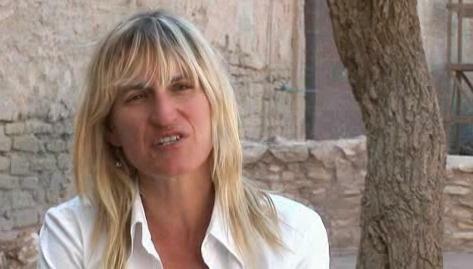 That said, I doubt that this would be how director Catherine Hardwicke sees it! I mentioned the Arts and Faith Top 100 on Monday. I've been meaning to watch Bergman's Wild Strawberries (#32) for some time now, particularly as it was also on the 2004 list and the one for last year. Well I finally got around to watching it, and enjoyed it immensely. You can read my review of it at Movies Matter. According to various reports The Ten is currently filming in New York. The original soundbites gave the impression that the film was going to be a spoof of The Ten Commandments, whereas now it sound like it will be a bawdy version of Dekalog, only compressed down to a couple of hours…and in English. Basically, it’s ten stories, each inspired by one of the Ten Commandments. Characters overlap and interweave... As it happens, our film has a very pro-Ten Commandments message - the characters that break God’s law pay the price. And none of the stories are about religion. The movie is obviously satirical and dirty, but it’s not mean. It actually does teach the Ten Commandments… just in a very ridiculous, funny way. I’m in a few segments. 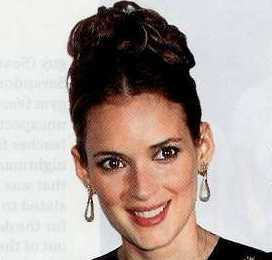 In one, I fall in love with a reporter, we go on our honeymoon, and go to a ventriloquist show. I fall in love with the dummy and we run away together…That vignette is for “Thou Shalt Not Steal,” which is great. [Laughs] I was keeping my fingers crossed for that one! 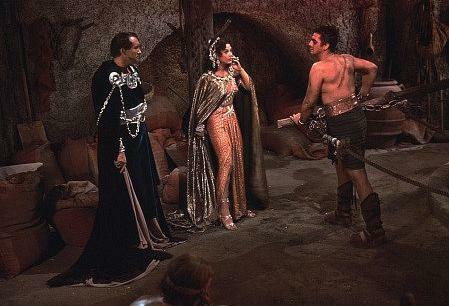 Firstly, it seems that although this is the type of movie that will probably draw criticism from certain quarters, it will ultimately uphold the importance of the Ten Commandments. By contrast, Kieslowski is distinctly ambivalent on the worthiness of some of the commandments in the Dekalog. Perhaps the only other passing similarity with Kieslowski’s films is that certain episodes will cover more than one commandment. For example, Ryder’s dummy vignette sounds like it fits both “Thou shalt not Steal”, but also “Thou Shalt not Commit Adultery”. It’s also interesting that she openly refers to her shoplifting incident, and, although it’s apparently coincidental, I wonder what attitude it reflects on her part. There’s also now an official website for the film which is fairly basic at the moment, just containing a list of stars and little else (no photos or publicity pictures), but it’ll be worth keeping an eye on for updates. Religious broadcasting tends to fall into four categories. On the one hand there are the church owned stations who present a mix of sermons, worship and chat shows on satelite and cable. Then there are the programmes on our national TV which consist of either more chat shows, “Songs of Praise” type worship coverage, or historical documentaries. At first glance, The Miracles of Jesus would appear to fit into this final category – historical documentaries. However, on closer inspection it turns out to be something different altogether, an exploration not of the historicity of Jesus’s miracles, but of their theology. Furthermore, this theological discussion has not been tucked away in some obscure, late-night slot, but in Sunday Evening prime-time. Such programming is risky. Setting aside the (non? )-religious zealots who want to see all religious programming barred from the air waves, there is also the challenge of how to make such a programme appeal to non-church goers, without gaining criticisms of being too lightweight or not Christian enough from the faithful. By and large The Miracles of Jesus pulls off this delicate balance admirably. The programme presented the questions in a way that was straightforward and clear, and yet even those with theological experience will have come away with some new ideas to think about. Personally I didn’t particularly like the use of “Time Slice” technology a la The Matrix, but I can appreciate how it might engage those who don’t normally watch programmes about theology. Unusually, for this type of programme, there are no interviews with various academics. Otherwise the documentary follows a familiar format. 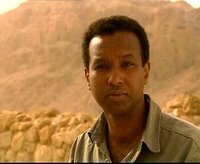 The presenter, former BBC Middle East correspondent Rageh Omaar, wanders around the original locations, narrating various accounts and offering a few explanations. This footage is interspersed with acted out reconstructions of how these events might have happened. Time Slice photography aside, these reconstructions are fairly strong. 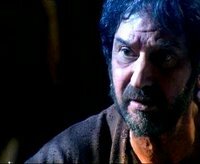 Taking a lead from Mel Gibson’s The Passion of the Christ, Jesus and his disciples speak in Aramaic. The portrayal of Jesus here is fairly unusual. 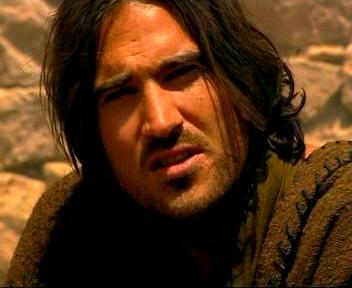 Firstly, the actor playing him (George Calil) is half Lebanese. Furthermore, Jesus’s hair is fairly short (although, curiously not as short as the previous documentary by these film-makers suggested it should have been), and he wears stubble rather than a beard. As this footage unfolds we also see that this Jesus is a man of action. He is strong, well built, and acts with confidence and purpose. 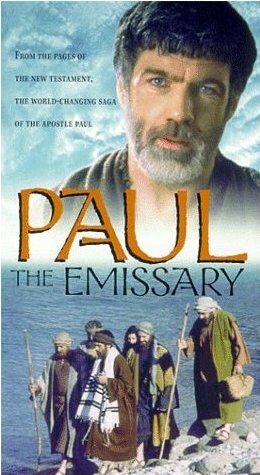 Whilst the programme primarily reconstructs scenes from Jesus’s life, it also supplements these with episodes from the lives of Moses, Joshua, Elijah, and Paul. One of the major points that is made is that some of Jesus’s miracles were not simply signs of God’s power, but also prophetic acts which spelt out who he was to those who surrounded him. It’s also not afraid to tackle difficult passages. The second programme, arguably the most complex as it examines Jesus self-awareness regarding his divinity, considers Jesus’s treatment of the Syro-Phoenician woman. Geza Vermes in his groundbreaking book “Jesus the Jew” suggest that here Jesus exhibits xenophobia. 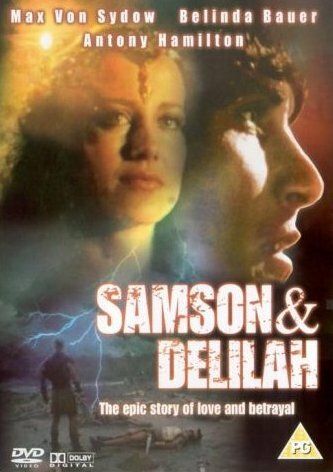 Whilst this is only implied here, it is an uncompromising portrayal of one of the gospel’s most troubling episodes. The final programme moves on to look briefly at Jesus’s death and resurrection, before investigating the birth of the church at Pentecost, and the ministry of Paul. Again this is theological territory, as opposed to historical ground. Throughout the series, Omaar is at pains to stress that it’s not so much whether these events actually were miracles that is important, but that those who witnessed them were. In other words we are looking at the theology of these events. Perhaps one weakness in this regard is that the programme never goes into the idea of literary creation. Whilst this card has been strongly overplayed in some circles (because as NT Wright notes, Jesus was just as capable of being a thinking theologian as his later followers), it’s certainly plausible that some of the more incidental similarities between Jesus’s miracles and their Old Testament counterparts were due to his biographers’ alterations. It’s a distinction that would have been useful, even though it is obviously impossible to do for each individual miracle. Overall though, there are relatively few quibbles with the series as a whole, and it is to be hoped that the BBC were sufficiently encouraged with the audience and the feedback that the programme has received to continue to make this type of programme.